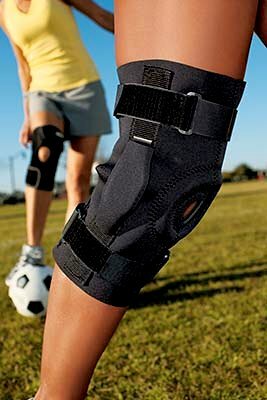 When only firm support will do, reach for the ACE™ Hinged Knee Brace. Equipped with dual-pivoting hinges at each side of the knee, this knee brace gives you the stability you need to stay in the game. Adjustable straps provide customizable compression while securing the brace in place. Reach for the ACE™ Hinged Knee Brace and do what you love. 1. Slide the wider, circular end of the support over your ankle and onto your knee. The middle of your kneecap should be under the center of the knee support. 2. With the knee straight, tighten lower front strap to align hinge with lower leg. Affix top strap in the back of thigh, ensuring not to tighten (do not cut off circulation). 3. Adjust straps and stabilizer as needed, to ensure correct positioning. To remove, simply slide the knee stabilizer down your leg until it reaches your ankle and slip it over your ankle to remove. Remove hinges and hand wash in warm water with mild detergent. Air dry. Replace hinges when dry.